Facing up to Global Warming: Eco Gyms - Generating Your Own Electricity? Eco Gyms - Generating Your Own Electricity? 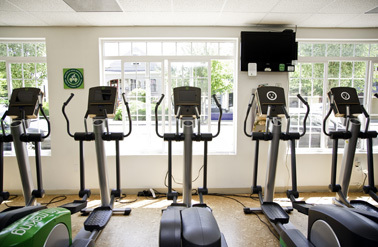 A photo of The Green Microgym in Portland, Oregon. Our world cannot become sustainable if the health our population is slowly deteriorating into a big lump of overweight consumers. Many gym enthusiasts will never give up their memberships in exchange for a jog outside, and many unfit or unhealthy individuals may have to rely on a gym as a way to find support and assistance in their efforts to become healthier. So, are gyms just a necessary evil that will go on producing emissions at remarkably rapid rates, and we should just turn our heads the other way? It doesn’t seem so entirely hopeless! I started doing some research into the topic of sustainability in gyms and quickly found that I am not the only person who is troubled by the vast amount of water and energy wasted by gyms, particularly in the US. There is a wealth of information about the inefficiency of gyms and health centers, but there is also an incredibly interesting new trend of what are called eco gyms. Eco gyms operate on the idea that they can capture the energy that is expended while working out and use it to power their facilities, in theory rendering the building self-sustaining. Like gerbils spinning around a wheel, humans in a gym are in essence doing little else beyond producing energy in the form of burning calories. One of the many gyms that I read about was from Portland, Oregon (my hometown!) and uses incredibly low levels of energy by using specially designed machines that are and hooked up to DC generators that produce energy to power the facility (3). The gym also uses refurbished and sustainably manufactured equipment (even mountain bikes made of bamboo!) and the bathrooms use special water heaters and eco-friendly cleaning products. Eco gyms are becoming increasingly popular around the globe (4). They also include lower levels of lighting, relying more on natural light, more eco-friendly water usage, and sustainable cafes in their lobbies. There are, of course many problems, such as the high costs of “greening” an already existing facility, and the fact that many gyms are too small to actually produce enough energy to run their own machines, but these ideas seem incredibly helpful in moving the fitness industry in the right direction (5). Of course, the only real way to eliminate emissions issues with gym facilities would be to move everyone’s workouts outside, but it would be great to see more facilities at least attempting to institute some of these practices or even for cities to start adding incentives for companies to do so so that our health and environment can become more sustainable. Some of these products, such as cardio equipment that captures and stores usable energy could even be useful in the home, producing power to fuel your ipods and cell phone chargers. You could offset your own footprint to some extent with your own human watts! I love the gym, but I am going to be more conscientious and start taking my workouts outside whenever the weather permits.